July 1 1909 -- Herriman's latest subject in the "Guess Who" series is a baseball player, presumably an Angel fielder, but there's not enough information here for me to ID him. UPDATE: Jeffrey Lindenblatt supplies convincing proof that this is Albert Russell 'Del' Delmas, who managed to flub two easy outs on June 30. LA beat Vernon despite Delmas's poor performance. 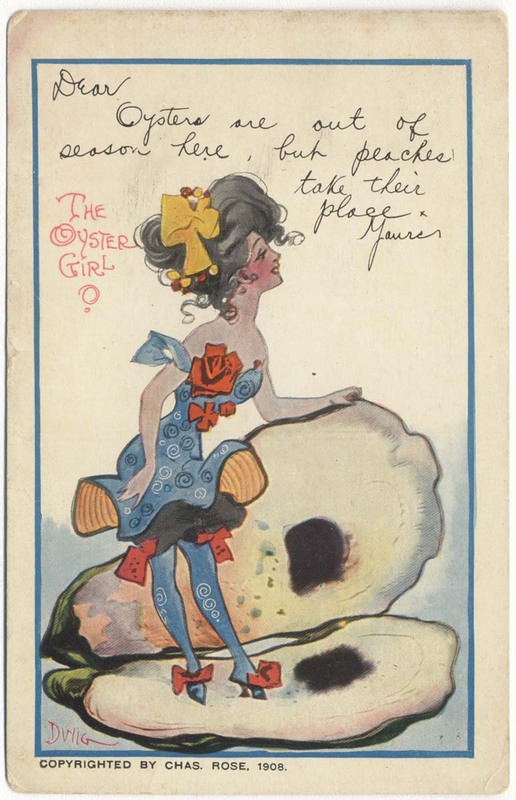 Here's a Dwig card from Charles Rose, dated 1908. Lovely understated and nicely blended colors on this one, with Dwig opting for a watercolor drawing instead of his usual penwork. I'd like to thank the postcard sender who didn't fill in the names on the front, keeping this nice card unmarred. After the conclusion of King News, I solicited ideas from you blog readers to see if we should continue digitizing books here at Stripper's Guide, and if so, what books you'd like to see. The response was less than overwhelming, but a few suggestions were made. The only one that got a seconding vote was for Gilbert Seldes's The Seven Lively Arts, which is certainly a seminal book and absolutely worthy of our interest here on the blog. Unfortunately, my search of copyrights indicates that it is not in the public domain due to being renewed in 1951. That affords it protection until at least this year, and probably longer. There was a request for the chapters in Our American Humorists that cover cartoonists, but that book has already been digitized. You can access it here. * The Life and Times of Kin Hubbard by Fred Kelly is perhaps too esoteric to be of general interest, and I seem to recall that there was not by any means an overwhelming amount of content about cartooning. * Roses and Buckshot by James Montgomery Flagg is certainly an interesting read, but it covers the world of illustration much more than cartooning, so perhaps not really quite on target here. * Portrait of an Era (about C.D. Gibson) by Fairfax Downey is another interesting read, but it is profusely illustrated, making it a real bear to digitize. * Drawn from Memory by John T. McCutcheon is, to the best of my memory, predominently about the author's adventures away from the world of cartooning. I seem to recall wondering when McCutcheon ever found time to draw his cartoons, as much time as he spent running around the world. A World Worth While by W. A. Rogers is another memoir that runs on the same trajectory. * Art Young's On My Way seemed perfect. I was surprised, though, to find that the book has already been digitized. * There are several memoirs of the New York Evening Graphic that I considered. They're all great fun, but considering that cartoonists are at best bit players in them, sadly not appropriate. * John Wheeler's I've Got News for You would be a fine candidate, but it's definitely still in copyright. That's about all I found, so we're going to dump the books for now, unless someone comes up with a good choice not yet mentioned. I realize it's not a book, but what about discussing old copies of "Cartoons" magazine? I was inspired by an eBay search I did last night, when a 1913 issue of that magazine turned up. A nice explanatory article from The Atlantic on copyright and why, after a long wait, we're all looking forward to January1, 2019. I'm amazed that Disney hasn't been on the ball, buying themselves more time. If we can just make it to Jan 1 2019, a whole new year of goodies -- including Seven Lively Arts -- will be conclusively in PD!! Thanks for the article DD. Arthur Charles Radebaugh was born on May 14, 1906, in Coldwater, Michigan. His birth date is from the Social Security Death Index and the birthplace is based on census records. His middle name is from a family tree at Ancestry.com. Michigan marriage records at Ancestry.com said Radebaugh’s parents, Cloyce A[lvin]. Radebaugh and Mabel L. Legg, were married in Coldwater on January 28, 1900. Radebaugh and his parents were listed in the 1909 Coldwater city directory at 180 North Hudson. The same address was recorded in the 1910 U.S. Federal Census. Radebaugh’s father was a foreman at a shoe factory; his World War I draft card said the employer was the Hoosier Shoe Company. In 1979 the Branch County Historical Society published History of Branch County, Michigan, Volume 2, which has a 1916 photograph of the Washington School fourth grade class of 21 students including Radebaugh. The Radebaughs’ residence remained unchanged in the 1920 census. Their last appearance in the city directory was 1922; at the time, Radebaugh was sixteen and a student at Coldwater High School. Where Radebaugh relocated was told by Jared Rosenbaum at Radebaugh: The Future We Were Promised which also has an impressive timeline of Radebaugh’s life and career. Rosenbaum said Radebaugh graduated in 1924 from Sturgis High School in Sturgis, Michigan. In 1925 Radebaugh enrolled in the School of the Art Institute of Chicago and learned about the airbrush. Radebaugh, after a year-and-a-half of schooling, worked as a bus driver, theater usher, and hotel clerk. 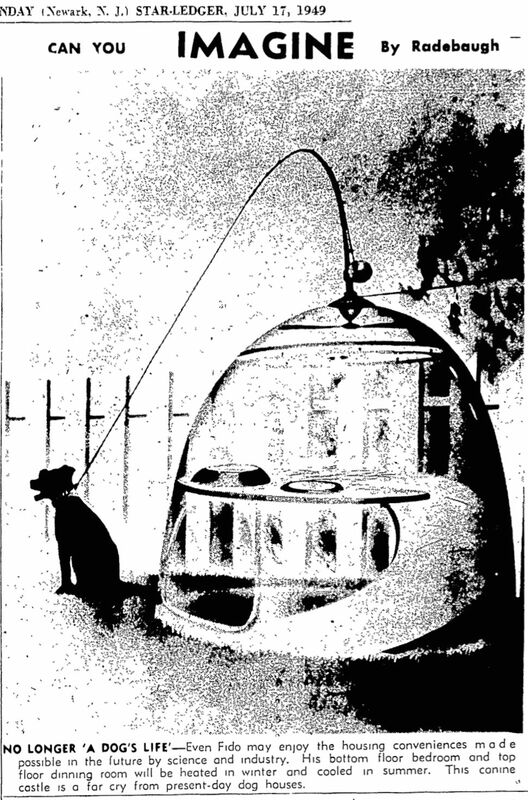 During 1929 Radebaugh left Chicago to become a beachcomber in Florida. According to the 1930 census, the Radebaugh lived with his parents in Sturgis at 704 West Chicago Road. His occupation was commercial artist in the sign painting trade. Rosenbaum said Radebaugh married Nancy Harrington on July 3, 1934 in Fort Wayne, Indiana. They made their home in Kalamazoo, Michigan. Radebaugh’s first appearance in Polk’s Kalamazoo City Directory was 1935. He resided at 413 West Dutton and was an artist at Crescent Engraving Company, “Commercial Photographers, Photo Engravers, Electrotypers, Commercial Art and Advertising Service 344 N Church”. The 1936 directory, at Ancestry.com, was not available, and Radebaugh was not listed in 1937, but Rosenbaum said Radebaugh was still with Crescent. Radebaugh’s career took a big step in 1935 when he illustrated the cover of Motor Show magazine. Rosenbaum said Radebaugh’s relationship with Motor Show lasted until 1957. He was commissioned by publications such as Advertising Agency, Esquire, The Saturday Evening Post and Fortune. 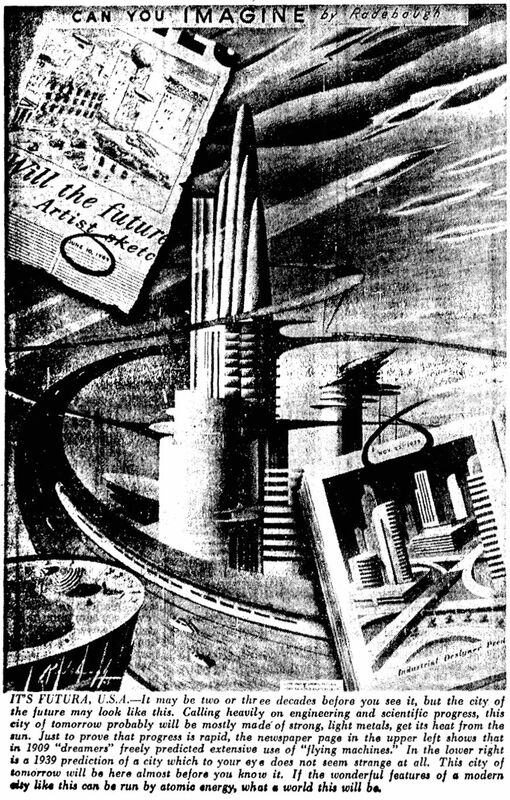 Radebaugh also illustrated numerous advertisements that appeared in trade and national periodicals. The 1940 census recorded an “Arthur Radebaugh” at the Wakefield Apartments, 111-07 73 Road, in Forest Hills, Queens, New York. According to the census, this self-employed person was born in Michigan and, in 1935, had lived in Kalamazoo. His age was off by three years and occupation was “aviator” but it’s possible the census enumerator misheard illustrator and wrote aviator. The name of the wife was “[illegible] Jean or Jenn” who was also born in Michigan and a 1935 Kalamazoo resident. 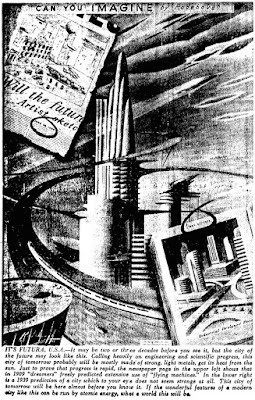 Despite the inconsistencies, I believe this person was Radebaugh the artist. It’s not clear when he moved to New York City and how long he stayed. Radabaugh enlisted in the Army. His Beneficiary Identification Records Locater Subsystem Death File, transcribed at Ancestry.com, has two enlistment dates, November 23 and December 3, 1942, and two discharge dates, September 23, and November 30, 1945. However, Radebaugh’s service started a bit earlier. The Evening Star (Washington, DC), October 11, 1942, published this item. The Washington section of the Society of Automotive Engineers will meet at the Cosmos Club at 5:30 p.m. Tuesday for a dinner meeting. Capt. A.C. Radebaugh of the Office of chief Ordnance will speak on “The Car of Tomorrow.” the Social hour will take place at 5:30, dinner at 6:30, and Capt. Radebaugh’s speech at 8 p.m.
Radebaugh held the rank of major when he was discharged in 1945. 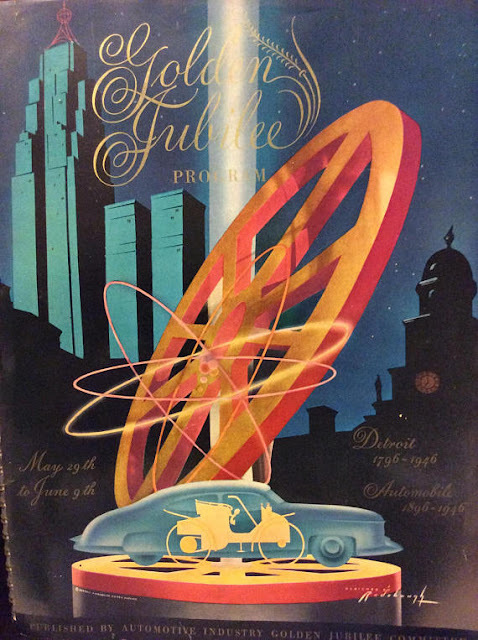 In 1946 the Detroit Golden Jubilee symbol (below) was designed by Radebaugh. 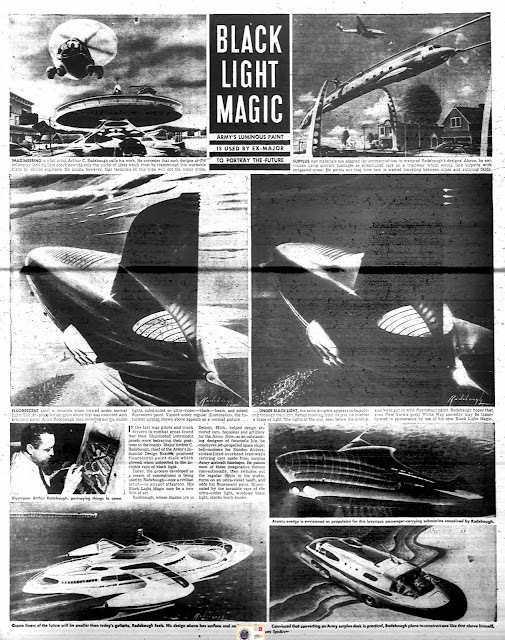 The News-Palladium (Benton Harbor, Michigan), September 27, 1962, profiled Radebaugh and said, “In 1946 Radebaugh showed a sheaf of what he likes to call his ‘imagineering’ to a representative of General Features, and thereby a hobby became one of profit….” General Features produced a Radebaugh pictorial that appeared in many newspapers including the Citizen-Register (Ossining, New York), March 28, 1947 (below). 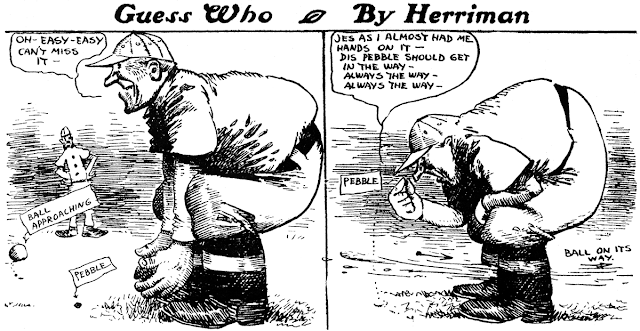 Radebaugh worked on four syndicated newspaper features. The first was Can You Imagine which was for the General Features Corporation in New York City. Can You Imagine ran in the Newark Star-Ledger* from November 30, 1947 to July 17, 1949; both are shown below. Wonders of the Universe is a thrilling new feature that tells the story of space-speed exploration of the skies in this scientific age. The author is Dr. I. M. Levitt, director of the famous Fels Planetarium and an associate director of the Franklin Institute…. Illustrating WONDERS OF THE UNIVERSE is Arthur Radebaugh, famed visionary artist. Born in Coldwater, Michigan, 40 years ago, Radebaugh was, even as a child, interested in futuristic art. From there he moved to Detroit, Chicago, the West Coast and New York. His air-brush futuristic art technique has now become internationally famous. Wonders of the Universe continued into the 1970s but Radebaugh’s contributions ended in 1958. American Newspaper Comics (2012) said Radebaugh produced two series for the Chicago Tribune-New York Daily News Syndicate. First was the Sunday feature, Closer Than We Think, which debuted January 12, 1958 and ended January 6, 1963. It was followed by Jet Swift and His Science Stamps which began January 20, 1963 and ran into the Summer or Fall 1963. Polk’s Royal Oak, Michigan City Directory for the years 1950, 1953, 1955 and 1956 listed Radebaugh at 4407 Seminole Drive. The earliest directory said he was an artist at the New Center Studio in Detroit. At some point, he moved. Radebaugh was in the 1960 Birmingham, Michigan city directory at 15825 Buckingham in Beverly Hills. He was a cartoonist with the Chicago Tribune-New York Daily News Syndicate. Radebaguh passed away January 17, 1974, in Grand Rapids, Michigan, according to his death certificate which was partially transcribed at Ancestry.com. A brief obituary was published by the Grand Rapids Press the following day. ** Wonders of the Universe appeared in the following newspapers: Cleveland Plain Dealer (OH); Columbus Dispatch (OH); Greensboro Daily News (NC); Jamestown Post (NY); The Oregonian (Portland, Oregon); Schenectady Gazette (NY); Seattle Daily Times (WA). Art Radebaugh has in the past decade or so come in for a little long awaited acclaim for his sometimes bizarre but always absolutely delightful feature Closer Than We Think, which was distributed by the Chicago Tribune syndicate from 1957-63. I think that you could fairly call the feature a cult classic at this point -- a filmmaker has even created a documentary about the strip and its creator. While Closer Than We Think has now registered a blip on the cultural radar, Radebaugh's next project, Jet Swift and his Science Stamps, continues to languish as a bona fide obscurity. In this instance, perhaps that's as it should be. After Closer Than We Think was cancelled on January 6 1963, Radebaugh was right back in the Chicago Tribune Sunday funnies section after just a single week off. The new feature, Jet Swift and his Science Stamps, covered science past, present and future, thereby opening the focus from pure science fiction. Presumably someone in charge at the Tribune either thought that Closer Than We Think was too far out, or that the Tribune should have a 'me-too' offering to counter the successful Our New Age science strip. 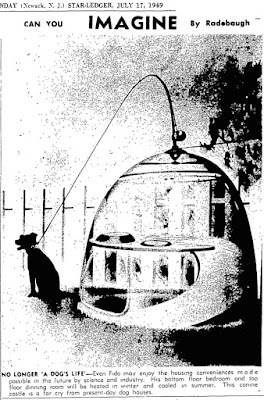 Perhaps to distance his new feature from Our New Age, Radebaugh came up with two 'innovations'. First, he added a narrator; unfortunately Jet Swift does absolutely nothing but take up a little space in each panel, pointing or gesturing in a complete vapid and useless manner. Second, he formatted the panel outlines as if they were postage stamps. Both of these novelties are utterly pointless, and worse, take away valuable space from the art. Jet Swift and his Science Stamps was not only ill-conceived but also exceedingly clunky and scattershot. Each panel stands on its own, so with no continued narrative it is impossible to actually explain a scientific concept. By design of the feature, Radebaugh can offer little in the way of real scientific information, so his panels are much more in the vein of Robert Ripley factoids than of Isaac Asimov explanations. His future material is still thought-provoking, but is now limited to one small panel. Not surprisingly, the new feature failed to find an enthusiastic audience. The Chicago Tribune itself dropped it with the installment of August 11 1963, while in syndication Jet Swift lasted until at least October (has anyone seen it later than that?). I'm the filmmaker you mention...would love to talk about Jet Swift and CTWT. Your Radebaugh posts are great! A quick correction in this article--There was no one week gap, CTWT ran until 1/13 and JSAHSS begins 1/20. Last Jet Swift is 10/27. JSAHSS is covered in my documentary about Radebaugh...as well as the comparison to Our New Age. Thank you for the info about the 1/13/63 Closer Than We Think end date. I must have missed it on the microfilm. What paper is your source for the 10/27/63 end date? Just to prove that on rare occasions I can actually remember to produce a post for a special event other than Christmas, here ya go. The Easter Story, posted a day late since I rest on Sundays, was an NEA closed-end strip that ran for one week from April 3 to 8 1950. The story was about 50% Bible verses, and the other 50% was uncredited. The art was handled by John J. Sunley, whose only other syndicated credit was on the first week of Ticklers back in 1940. Sunley certainly shows off his stuff to good advantage in these moody, tone-rich strips.